It’s not always about football on Super Bowl Sunday. 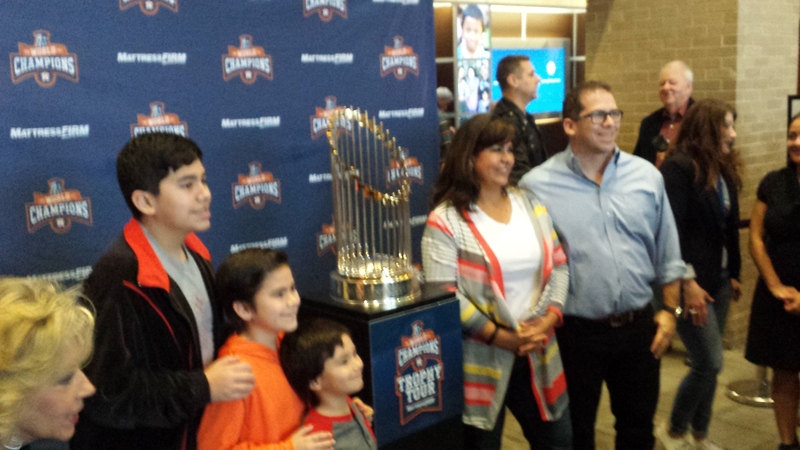 On their way to church services and Sunday School classes this morning, hundreds of Houston Astros fans and visitors got a chance to see the Astros World Series Championship Trophy in the lobby of Houston’s First Baptist Church. 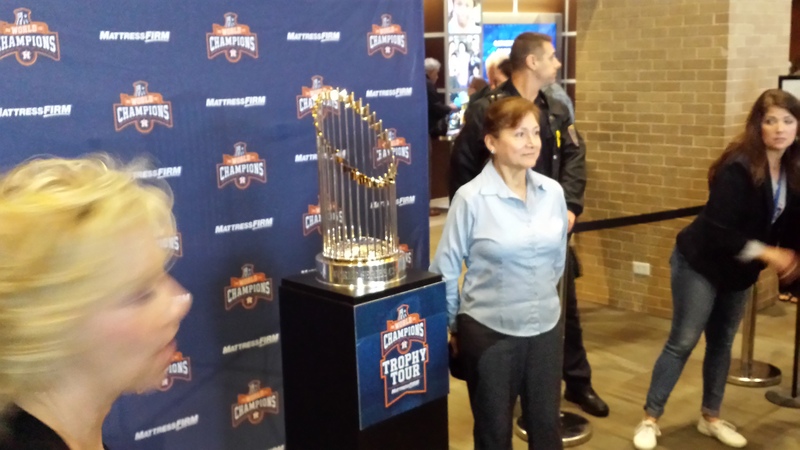 The year-long trophy tour is free and open to the public. It’s also an unofficial day to enjoy Super Bowl food, even if you don’t follow sports. According to the National Chicken Council, some 1.35 billion chicken wings will be eaten this weekend as the Philadelphia Eagles and New England Patriots play tonight for the championship Lombardi Trophy in Minneapolis. 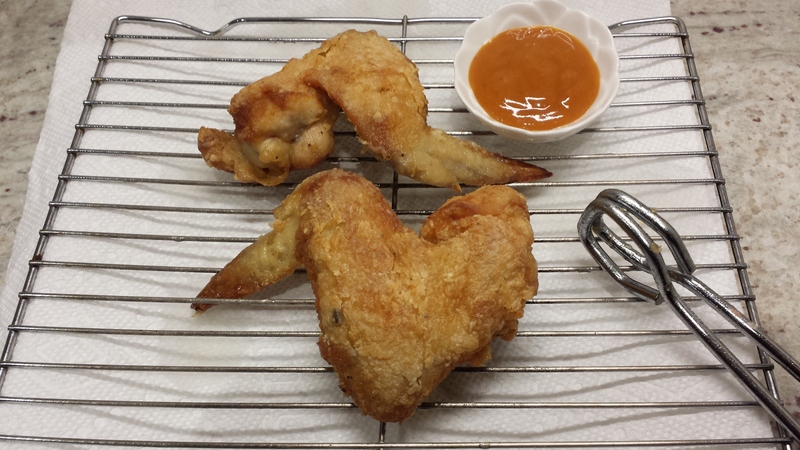 Here’s an adaptation of the Takeout Fried Chicken Wings recipe from the Woks of Life food blog. Except for the oil, mix all ingredients together in a large bowl so that the wings are coated in batter. Refrigerate for 4 hours or overnight. When ready to fry, take out batter-coated wings and let sit for 15-20 minutes at room temperature. Dredge each chicken wing in a mixture of 1 tablespoon flour and 1 teaspoon cornstarch. Fry 2-3 wings at a time in a pan or wok over medium to low heat for 5 minutes. Cover during frying. Remove and drain on paper towels. Re-fry all wings for 3 minutes. Cover during frying over low to medium heat. Drain on paper towels before serving. Serve with favorite sauce. Above, we mixed equal amounts of catsup, mustard and honey for our wings dipping sauce. Add hot sauce for spicier flavor. This entry was posted in Asian Community, Celebrations, Church News, Community Events and tagged Astros Championship Trophy, Fried Chicken Wings Recipe, Super Bowl Sunday 2018. Bookmark the permalink.